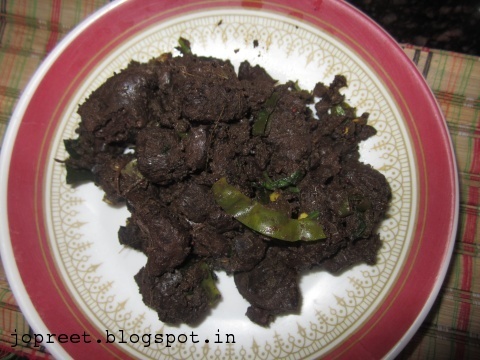 Lamb blood looks horrible but when it is cooked it looks like mutton liver and tastes good. Wash the lamb blood nicely and smash it with hand in small-small pieces. Heat oil in a kadhai and temper mustard seeds. Add onion and green chillies. Fry it till turns golden brown. Add ginger-garlic paste and tomatoes. Cook it for a minute and then add turmeric powder and red chilli powder if needed for more spice. Add smashed pieces and mix well. Add salt to taste. Cook it covered for 15-20 mins. Check it frequently so that it don’t get deep fried. It should be dry and garnish with coriander.